Resplendent sunshine drenches the Spanish shoreline and entices visitors to escape to an island paradise with exotic and diverse scenery. Discover the beautiful island of Tenerife with its craggy mountain vistas, volcanic landscapes and breathtaking coastal seascapes. Adventure awaits at Teide National Park where outdoor trails meander through a land of volcanic origin comprised of lava rocks, lava streams and ash beds. 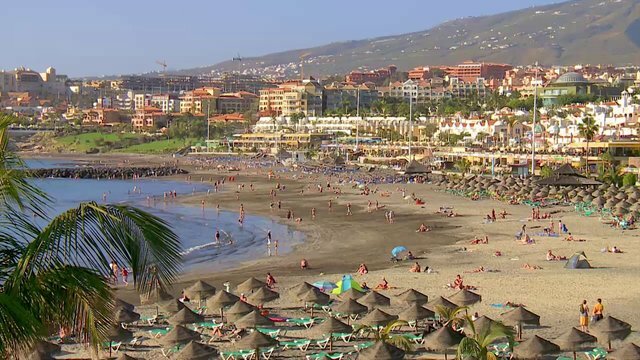 Play all day on sandy shores and in sapphire blue waters of the salty coast, then venture toward the bright lights and lively music emanating from the pulsating nightlife of Playa de las Americas.Built in the traditional style of an Andalusian pueblo blanco, or white village, Sunset Harbour offers a tropical haven in paradise. Gracefully designed to create a soothing atmosphere, ideal for a relaxing retreat, this peaceful hideaway delivers the ultimate in comfort. Spacious accommodations—with lovely appointments, modern furnishings and well-equipped kitchens—also include large balconies that boast stunning panoramas of the spectacular mountain backdrop. Embrace all that Sunset Harbour Club has to offer with its beautifully landscaped outdoor pool, exotic gardens and palm-lined pathways. Our comfortable studios feature a spacious bathroom, partially equipped kitchen, compact living space with TV and DVD player. All of them have beautiful terrace/balcony/garden areas. Discover comfort at Sunset Harbour Club in our 1 bedroom accommodations featuring a beautifully appointed bathroom with a shower and a hair dryer. Some accommodations include a full bath. Enjoy a partially equipped kitchen with many modern appliances including a microwave, refrigerator and coffee maker. Let its fully furnished living space with television and DVD player delight you. Additional amenities include telephone, safe, iron/ironing board and in some units a beautiful terrace/balcony area. Discover comfort at Sunset Harbour Club in our 2 bedroom accommodations featuring a beautifully appointed bathroom with a shower and a hair dryer. Some accommodations include a full bath. Enjoy a partially equipped kitchen with many modern appliances including a microwave, refrigerator and coffee maker. Let its fully furnished living space with television and DVD player delight you. Additional amenities include telephone, safe, iron/ironing board and in some units a beautiful terrace/balcony area. Directions to Resort: (From Reina Sofía) Follow the signs to Los Cristianos, the TF1 and then Adeje. Take exit 74 (San Eugenio) and turn left over the bridge (to the right of the Costa Adeje Clinic). Follow the road until you reach the roundabout and go straight over (the San Eugenio shopping centre is on the right). Get in the left lane and follow the road straight ahead (passing Harley's on the left) and keep following the road until you see Hotel Hovima Costa Adeje (on the right). Take the next left into Calle Valencia and Sunset Harbour is at the bottom of the road on the left hand side. Reception is located within the Pueblo Torviscas Complex. The tourney time is approximately 30 minutes. Directions to Resort: (From Los Rodeos) Join the TF5 south and, after approximately 3km, take the junction marked Los Cristianos and South Airport. This will take you to the main TF1 motorway. Continue to follow signs for Los Cristianos and then Adeje. Take exit 29 (San Eugenio) and turn left over the bridge (to the right is the Costa Adeje Clinic). Follow the road until you reach the roundabout and go straight over (the San Eugenio shopping centre is on the right). Get in the left lane and follow the road straight ahead (passing Harley's on the left) and keep following the road until you see Hotel Hovima Costa Adeje (on the right). Take the next left into Calle Valencia and Sunset Harbour is at the bottom of the road on the left hand side. Reception is located within the Pueblo Torviscas Complex. The journey time is approximately 90 minutes. Shops hours from 9:00 to 20:00. As per the annual maintenance weeks, work will be carried out from 10 am-5:30 pm Mon-Sat. Construction materials will be visible in all areas of the resort though disruption and disturbance is expected to be minimal although some noise may be experienced. As such please accept our apologies for any inconvenience caused. As part of our continuing efforts to enhance the resort, renovations of our one bedroom apartments will take place from the 02/09/2019 until the 11/11/2019 in two different blocks. Construction materials will be visible in all areas of the resort though disruption and disturbance is expected to be minimal although some noise may be heard. Works will take place from 10am until 5.30pm Monday to Saturday. Please accept our apologies for any inconvenience caused. We invite you to dine with us on site at The Clubhouse Restaurant. Step into the welcoming atmosphere of this family friendly restaurant featuring an international menu that is sure to satisfy everybody´s appetite. Savoury dishes and delicious snacks are available for dining in, or for take away. And if you had any special requirements, let us know at least 24 hours in advance and we will accommodate your needs. Are you celebrating a special occasion? The Clubhouse Restaurant would love to help you make your day memorable. Call us on 922 70 25 58 or 922 71 46 90, ext 607 today! Enjoy our fantastic half board option which includes breakfast and a two course evening meal chosen from our evening menu for only €18.50 per person per adult minimum booking 3 days (drink not included). Make the most of our happy hours from 1pm – 7pm daily with reduced prices on beer, house spirits and cocktails. Highlights: Sunset Harbour Club is located just a few minutes from the beach, shops, restaurants, and the exciting nightlife of Playa de Las Américas. The accommodation choices are built in typical Canarian style, all with satellite television. The resort is close to the exclusive Puerto Colon marina, and you can enjoy all the facilities of the harbour. The street where the resort is situated is flat however some of the pavements are uneven and are in need of repair. Once you are at the beach, the walkway is flat. Street level, easily accessible and accessed by ramp. The main doors open automatically. Ground level access to one restaurant. One is accessible by a steep ramped access which should be negotiated with care. Ground floor accessed by ramp apart from French Boules and giant chess, which are accessed by stairs only. Pool hoist in the upper pool. Bottom pool has ramped access without steps with handrail. Sunset Harbour does not has its own car park though there is a public car park close by. There is one accessible parking bay available in front of the resort. Please note that there is a limited car parking in the vicinity of the resort. Bus stop within short walking distance; not all buses are wheelchair accessible. Taxi stop nearby; wheelchair accessible taxis available upon request.